Women as a whole have begun showering and washing their hair less frequently during the past two decades or so, with many of them individually acknowledging that they have begun showering less in the past few years. Multi-sponsor Surveys’ 2017 Target Market Report on Shifting Patterns in Women’s Hygiene examines the factors potentially motivating women to shower and wash their hair less often, and the extent to which these shifting trends impact the use of women’s haircare and grooming products. Consumer research data shows that many women have begun showering and washing their hair less frequently during the two past decades or so. This report examines the factors potentially motivating women to wash less often, and the extent to which these shifting trends impact the use of women’s haircare and grooming products. 2014 Report on Women’s Shift From Daily Showering/Impact on Body Freshening Products which examines changes in women’s bathing up to 2014. Interviews for this study were conducted online in August 2014 among a nationally representative U.S. sample of 534 adult women (ages 18 and older). 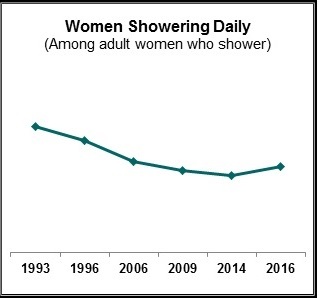 Trends are based on earlier studies of women’s bathing/showering habits conducted from 1993-2009. 2017 Study of the Market for Deodorant and Body Spray which examines the current market for deodorant products and body sprays among men and women and includes questions includes questions that match a number of trended questions in the 2014 Report on Women’s Shift From Daily Showering (above). Online interviews were conducted from November to December 2016 among a national sample of 1,000 men and women age 18+, with quotas for 400+ deodorant users and 200 body spray users. 2016 Brand Imagery Study of Women’s Hair Appliances which presents trends in hair care routines, appliance usage habits, preferences, and brand awareness. Online interviews were conducted in August 2016 among a nationally representative sample of 1,120 women age 18+, with oversamples of African-American and Hispanic women to achieve 200 interviews each. The total sample included a naturally occurring subset of 783 women who use hair styling appliances (screened for past-month usage). 2016 Study of Infant & Toddler Skin Care, the second study designed to examine the skin care practices of mothers with infants or toddlers under the age of two years. Online interviews were conducted in June 2016 among a national sample of 604 mothers with children less than 2 years of age. Follow by Detail Sections including graphs and charts depicting survey findings.